After years of shunning it because of bad service and underwhelming food, regular blog readers will know that I am in love with Pu Kwong now that they have new management. Pu Kwong is great, because it is close to me and the food is very tasty! I have already blogged a lot of my visits there. This particular visit was a Sunday night dinner on the weekend that Leigh and J were visiting (I have already blogged about all our other food adventures during that weekend), and we ordered some of my favourite things! 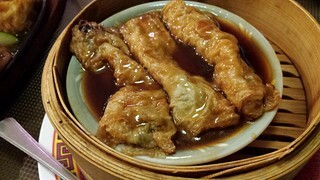 My favourite starter from there is the Beancurd Rolls, which are just delicious. I can't get enough of them! 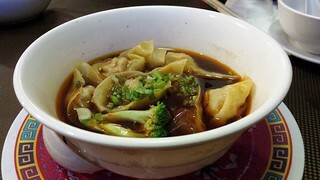 We also ordered some Dumplings in Spicy Broth. When I say we, I mean mostly Leigh and J. I tried some and while the dumplings were very good, the sauce was just way too spicy for me. But Leigh loved them, so if you like spice this is the starter for you! 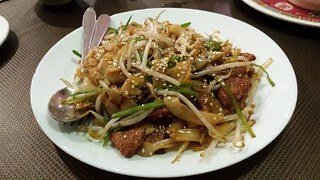 One of my favourite dishes there is the Beef and Ho-Fun Noodles. While their mock beef isn't my favourite texture-wise, the sauce and the noodles are just so damn good. 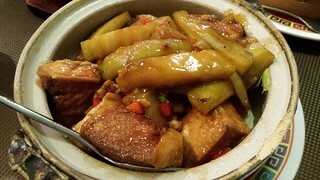 The Eggplant and Tofu Hotpot in Special Sauce is another favourite. 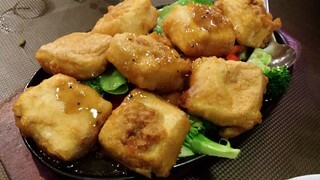 The special sauce is a little sweet, but full of flavour, and the tofu and eggplant bits ore big and perfectly cooked. We also ordered the Sizzling Stuffed Tofu, which unfortunately was the least impressive part of the meal. I was expecting the something similar to the delicious stuffed tofu you can get from Green Gourmet in Sydney. And while there was a similarity, this ended when they coated and deep fried them. They were pretty oily, and there was nowhere near enough sauce to coat them either. A bit sad. At least there was some broccoli! 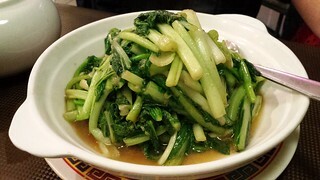 And finally, some Chinese Greens in Ginger Sauce. Because greens are important! It was a lovely dinner, even though one of the dishes was a miss. I really enjoy having Pu Kwong so close now that it is generally so tasty! This sweet silver girl was called Pascall. She was my little companion for such a short time. Not quite as short as Max, but tragically she was FeLV positive and got cancer before her first year. But for that year she was delightful, and I am very glad we got to be together. Everything looks great; too bad about the stuffed tofu, though. What a nice picture; it sounds like Pascall was a real sweetheart! Won't be ordering that again. Pascall was a really sweet girl. And so photogenic! Silver tabbies aren't that common, and they are very striking. I haven't been to IKEA in so long! I want to get some vegan meatballs, but I am concerned that I will buy too many random bits and pieces as I wander through. Everything looks delicious! And i love spicy so i would've love those dumplings! 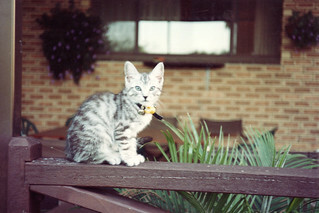 Pascall was very lucky she had someone like you to care for her, she was a very pretty kitten! They have a lot of spicy food on their menu, so you would be pretty happy. Oooh great eats! Looks like a great place to eat. I am definitely lucky to live in an area with several vego Chinese restaurants nearby.